Many children struggle to enjoy and excel with mathematics courses taught in schools. 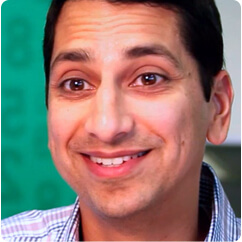 Math Plus Academy was born out of Raj Shah’s passion to change that reality—enabled by Infusionsoft. Raj Shah saw a problem with education. Kids just weren't getting excited about learning math. Too often, in Raj's opinion, children are not sufficiently excited by traditional school math programs. So, he decided to do something about it. In 2009 Raj founded MathPlus Academy, a tutoring company with a strong focus on math, science, and technology. "Math Plus Academy is a place where kids can come and really learn to enjoy mathematics," says Raj. "They can learn better ways to solve a problem." However, there was one problem that Math Plus Academy could not solve: how to broadcast a message to the customers who would care about it, without overspending on advertising. As Math Plus Academy expanded its offerings, including the introduction of a summer math camp, customers needed a way to educate themselves about new products and easily make a purchase online. Raj also found himself spending too much time on the day-to-day tasks of running the business and not enough time developing his educational programs. Contacts were managed with massive spreadsheets and email inquiries from leads and customers often went unanswered. Without the right tools in place, Raj would have continued spending hours every week trying to manage communications instead of developing his curriculum. Additionally, Raj explains, "I would be spending thousands and thousands of dollars a month broadcasting my message to people who don't care." When Raj began using Infusionsoft, he realized how much more efficiently he could run the business—and how much more time he could spend on his true passion, teaching math to children. "Now we use it for everything," says Raj of Infusionsoft. "It's totally revolutionized how we do things." Raj's one-dimensional spreadsheets were replaced with a robust customer relationship management (CRM) system, which could store everything from a contact's interests to their purchase history. The time that Raj spent on billing dropped from 20 hours a week to less than three. And the integrated e-commerce module gave him the ability to easily sell his courses and camps online. Now, children attending Math Plus Academy are flourishing and the love of math has spread far and wide among Raj's customer base. "Now that I have [Infusionsoft]," Raj raves, "I don't see how you could not have it." Infusionsoft helped the businesses above. Now see how we can help yours.